When you customize the strings, you usually want to add to the list, rather than remove existing items – especially if you have any tickets that already use one of those values – though this is your choice. The ID number attached to each value is what is stored in the database; they need to be unique and not change over time, but do not need to be spaced out by units of 10 (that’s more helpful when modifying the status values, as that’s used in a workflow). The description string is displayed to the user in the web front-end but is not stored in the database. Push these two files to the root of your MantisBT install (no need to restart any services) and you will now see the new resolution value when closing a ticket. 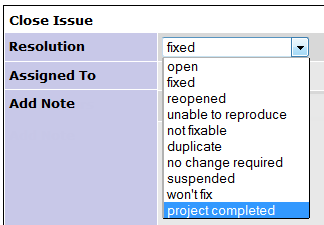 You could also choose to rename a value – the number is stored in the database, so you could change all tickets with a resolution value of “suspended” to “no funding available” by only changing the string value – or remove unused values. There is no cleanup, though, so removing a default or custom resolution value won’t modify existing tickets that have that value. In that case, the resolution value will display as @91@ instead of project completed. Be sure to add the files config_inc.php and custom_strings_inc.php to revision control and deploy them with any MantisBT upgrades to avoid these problems.